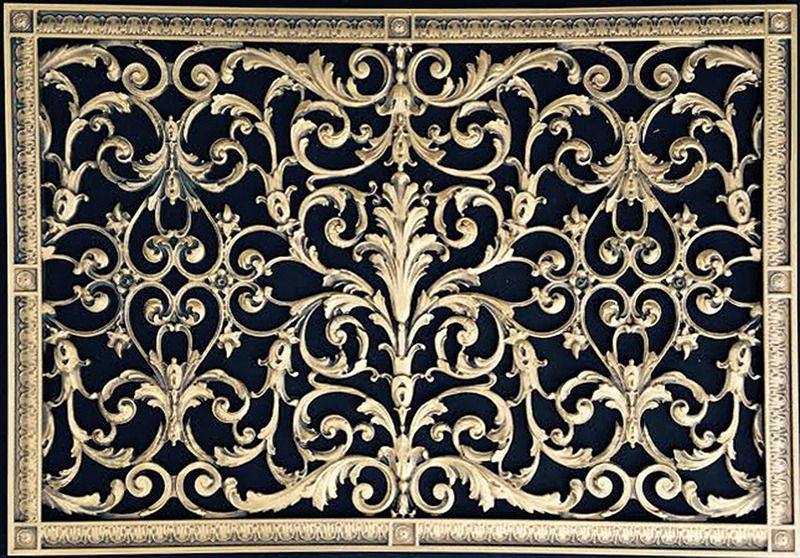 Beaux-Arts is the premier manufacturer of historical reproduction decorative grilles. Our grilles are unique in the industry. All our decorative grilles are reproductions of historical grilles or ornamentation. This beauty is from our Louis XIV collection. It is shown in our Antique Brass finish. The grilles are cast in the highest quality urethane resin and are available in over 14 finishes. Beaux-Arts has combined the beautiful craftsmanship of the past with the most current technology of today. We use laser scanning to capture the beautiful carvings of the historical grilles and 3-D software to manipulate the scans to create sizes which work with modern heating and air conditioning grilles. All the grilles are hand cast and hand finished in the US. Our Arts and Crafts decorative grilles have been completely re-designed. We offer it in 58 sizes and over 14 finishes. Our grilles can be used for radiator covers, in the wall or ceiling speakers and filter grilles. This incredible speaker grille piece is a great alternative to industrial in the wall or ceiling speakers. We have had customers use our grilles for balustrades, door panels, ceiling inserts and table tops. Since the grilles are cast in resin they are easy to cut. The grilles are appropriate for both interior or exterior applications. Since they are made from an exterior grade resin they are impervious to water and can be used in wet or damp locations. They are frequently used as decorative fan covers in bathrooms, or near indoor swimming pools. Our grilles have appeared on TV and in the movies. They are easy to install. If you are installing grilles without dampers we suggest painting the ductwork directly behind the grille with flat black paint. Flat black paint does not reflect light, therefore making the duct disappear. If installing a grille with a damper, the damper is painted flat black and may not require any additional painting of your ductwork. If for any reason you still see ugly ductwork, paint it flat black, before installing the grille.